William Wilkie Collins was an English novelist, playwright, and short story writer best remember today for his novels The Woman in White (1859), No Name (1862), Armadale (1866) and The Moonstone (1868), considered the first modern English detective novel. 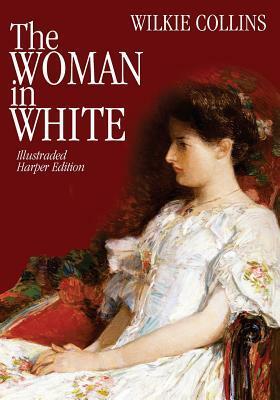 The Woman in White, also a mystery novel and perhaps an early example of detective fiction, is considered among the first and the finest novels in the so-called "sensation" genre. It is also an excellent example of Victorian serial novels. Before they appeared in volume form, these novels were first published serialized in installments in magazines such as the well-known ALL THE YEAR ROUND, a weekly journal curated by Charles Dickens. The Woman in White was published in 40 weekly installments. The original publication in ALL THE YEAR ROUND did not contain illustrations, but the novel was also published concurrently in the American magazine Harper's Weekly in a serialization that included the illustrations by John McLenan later used in the publication in book form. This printing of the novel by follows the organization of the American one volume printing by Harper & Brothers Publishers and includes the Preface to the 1890 edition and all the illustrations by John McLenan. Unlike a facsimile reproduction, in this edition, the entire novel has been reset using a two-column format that preserves the look and feel of both the original magazine and the first book printing layout.